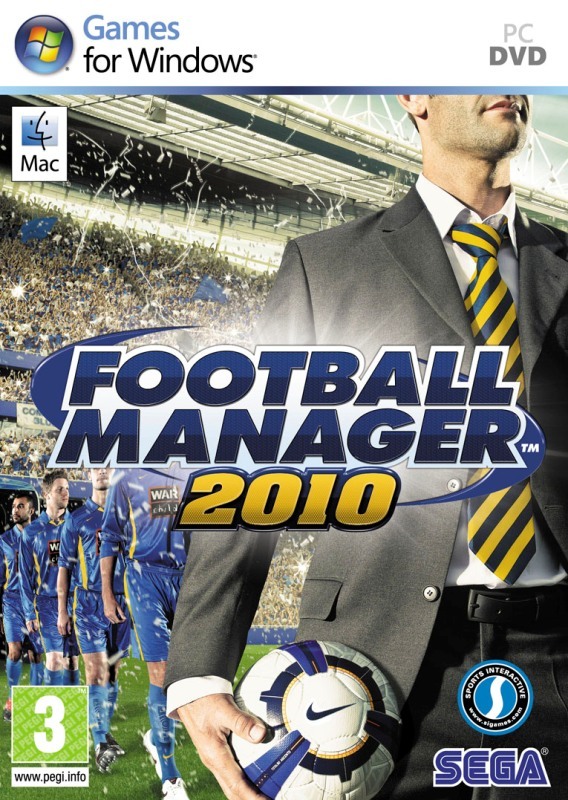 Football Manager 2011 is working also in Ubuntu and Linux Mint. I have already installed and also play it (there is a picture). If you want a detailed installation steps please take a look on this tutorial. Also you can enter on the official WineHQ page and look on what other are posting about their issues regarding FM2011. I have to mention that I use patch 11.3.0. because on 11.2.1. I hade some problems, meaning that after finishing the first game click on the Continue button or pressing space button the game is braking. Allways I've liked to play games and specially the ones with football, or soccer like americans say, but after installing Ubuntu Linux playing games wasn't so easy like in Windows. here you have to choose in Applications tab Windows Version: Windows XP, in Graphics tab uncheck Allow Pixel Shader and on Audio tab deselect everything. Install Java, the version for Windows (it's required for your Wine environment). You have to download the Java from here. Navigate to where you downloaded to and double-click on it. It should open up in Wine (accept agreements and defaults). 4. open winetricks and from the list of programs choose all d3dx9 and d3dx10 or you could download d3dx9_36.dll from here. 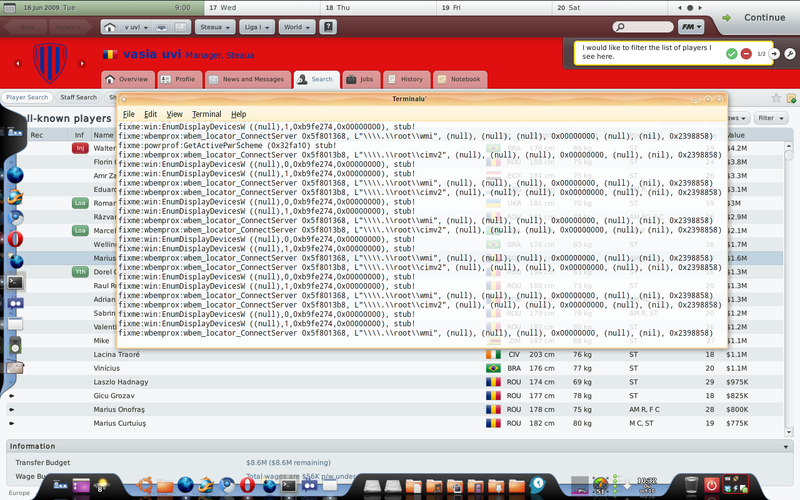 After this extract the dll in /home/user/.wine/drive_c/windows/system32/. 5. with winecfg go to Libraries tab and from the drop-down list select d3dx9_36 and add it. 6. disable mmdevapi in winecfg under the Library tab. Here in the Existing overrides type mmdevapi, it will be selected and after that press edit and from there choose disable. Also you can try the same thing by choosing on openal32.dll the native one. 8. Now we can start to install FM2010. Go in the folder where you have the setup.exe. Double click on it or in Terminal with cd command go in the location where setup.exe is and type wine setup.exe. 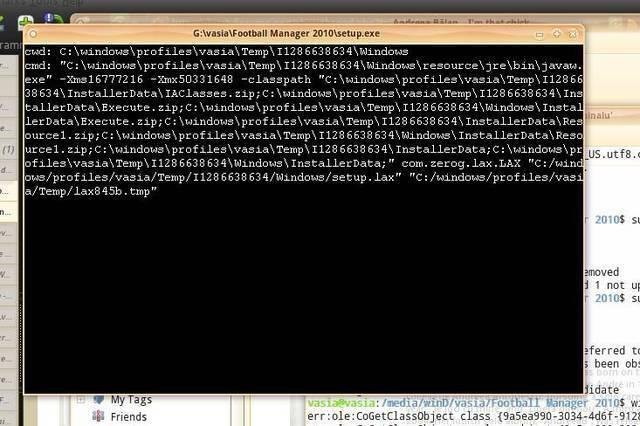 A window like this should appear and if after AnywhereInstall the install window doesn't appear look if you have done step 2. On my side didn't worked because I had checked Allow Pixel Shader. It's important to select the installation offline, do not choose to install DirectX. Download the patches and install in the same manner, double clicking on them one by one. You can also download a no-CD crack and copy over the fm.exe in the ~/.wine/drive_c/Program Files/Sports Interactive/Football Manager 2010 folder. To start the program you have to enter in the same folder from above and writte in the Terminal wine fm.exe. If everything it's configured OK and maybe with some luck you should enter in the game. I've disabled 3D game in the Preferences of FM2010 and also closed the sound. Try writting the above commands and wait a litle bit before the game starts! Or, like @Alex in the comments bellow told me and also is working is to typer wine fm.exe and if we see that it doesn't start to CTRL+C and try again with wine fm.exe.....until is working. I really don't undestand why I have to do this but for me it worked. When installing I've got some errors and looking and searching on google I've found the answers above. Please, if the above steps are not working keep trying, search on google the errors, read the winehq.org forums, put a question on ubuntuforums.org and maybe you will reach to win Champions League with your favorite team.